We were out for a day of hiking, too, so we decided to test two of the trails. The park’s brochure says, “strenuous” to describe the trails, and they are. 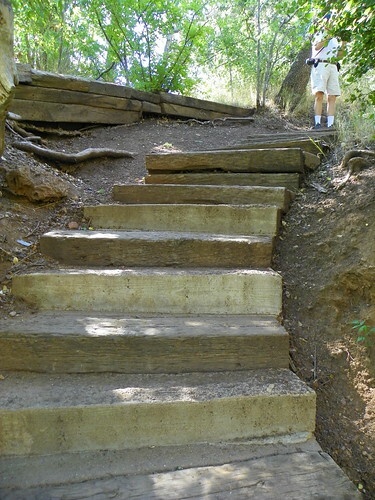 The Waterfall Trail, while short, has angled, narrow steps that are partly wood, partly metal mesh and partly rock. Water flows over some of the walkway and it is definitely not for anyone with a disability. While only 300 feet long, the trail is a challenge! 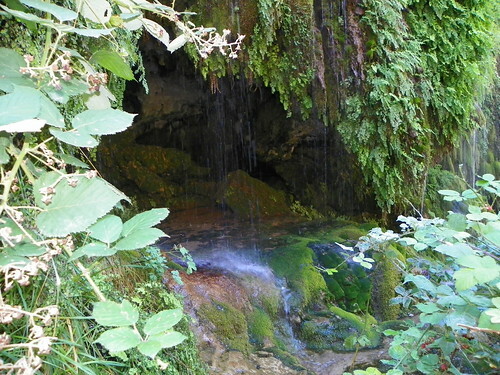 At the bottom is a narrow area with a cave-like grotto surrounded by vines and foliage with a small falls. You must take turns to see the very end of the trail, since it is narrow. 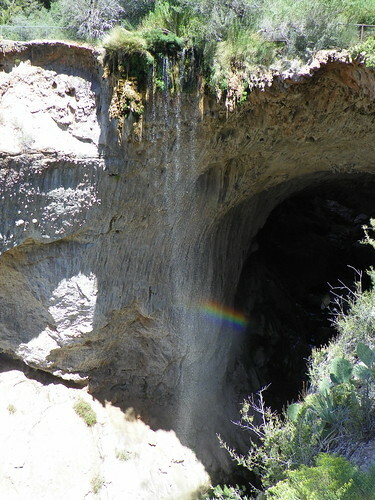 We stopped briefly to look at the natural bridge from these perspectives and were rewarded with a rainbow emanating from the falls. Again, the brochure warns that the trail is strenuous. Do people pay attention? NO! We saw people with flip flops and other footwear ill-suited to the twists, turns and narrow stairs. The trail continues – up, down, and around – for nearly a ½ mile and arrives at an observation deck from which people can venture into the bridge. Not for the faint of heart or for persons who are not surefooted – I had hiking boots on and still slid and fell just as I was almost back to the deck. The rock is highly polished by the constant spray and EXTREMELY slippery. 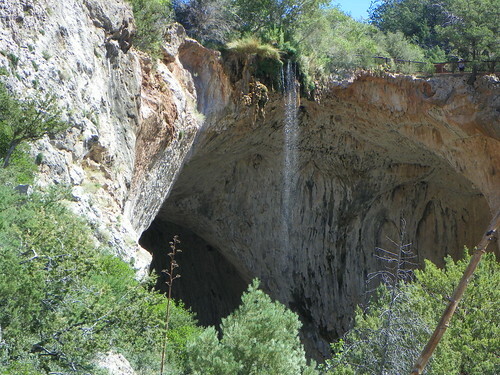 There are pools of water nestled in the rock areas and it is not a good place to navigate even with the best of shoes. A park guide said that even with just socks on, he didn’t think it was an easy experience. One able-bodied male in his late 20s indicated he wished he had our hiking poles. There were some elderly people looking exhausted and huffing and puffing. 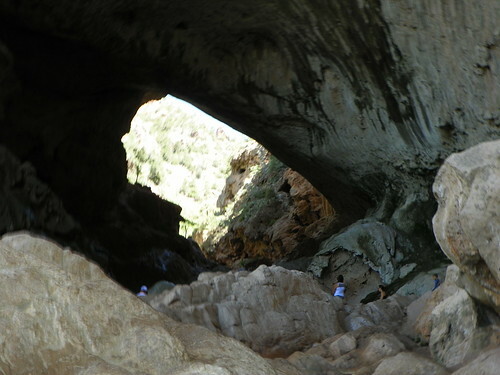 Let me repeat – do not attempt this series of hikes without water, proper shoes (and, even then, it isn’t easy to navigate at the actual natural bridge), and, perhaps, a hiking pole. Note: Only portable toilets are available in the parking lots. Bring hand sanitizer. You should bring your own drinking supplies – and a lot. The altitude (if you’re not used to it) and the climbing up and down the steps are demanding, so you need water. We did enjoy the experience, but I wish I had not ventured on the slippery rocks. Next week… The oldest schoolhouse still in existence in Arizona and some craft-y people. 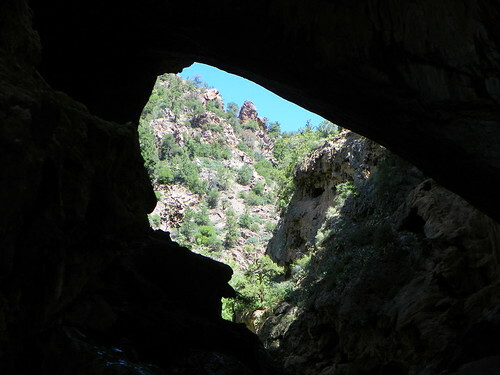 This entry was posted on Monday, September 6th, 2010 at 6:00 am	and is filed under Adventure, Arizona, Family Fun, Hiking, Historic, Mountains, Scenery, Travel. You can follow any responses to this entry through the RSS 2.0 feed. You can leave a response, or trackback from your own site. Hello, very professional high level of writing it! So many people to comment, let me also to comment on it. Because good writing, and I learned a lot, and I am glad to see such a beautiful thing. Thanks very much ! Thanks so much for writing a lot of this good information! I am looking forward to reading more!